This tract is so big it is ideal for giving out at parades and events where large crowds of people are gathered as once people start seeing it being read, they all want to own one. 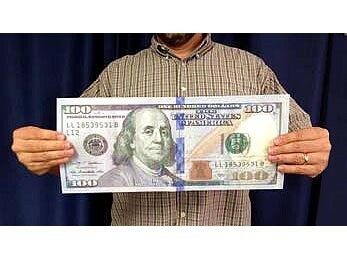 How many people can you find depicted on this $100 bill? You might be surprised to know that there are four; see if you can find all four. Many years ago there was a popular song called “American Pie.” It contained the words: “Did you write the Book of Love and do you have faith in God above...? Do you believe in rock and roll? Can music save your mortal soul?” Then the chorus said, “This’ll be the day that I die, this’ll be the day that I die.” The fact that each of us is just a heartbeat away from eternity is sobering, but true. This could be the day that I die. After all, approximately 150,000 people will die in the next 24 hours. The biblical explanation for why each of us will die is fascinating. It says we have broken an uncompromising law, and that the penalty is death. Let’s see if you have broken this Law (the Ten Commandments): Is God first in your life? Have you made a god to suit yourself? Have you ever used God’s name in vain? Have you always honored your parents? Jesus said, “Whoever looks at a woman to lust for her has already committed adultery with her in his heart.” Have you ever lusted? Have you hated anyone? If so, the Bible says you are a murderer at heart. Have you ever stolen something (irrespective of its value)? Then you are a thief. If you have told just one lie (even if you call it “white”), you are a liar, and you cannot enter the Kingdom of God. Listen to your conscience. The Law leaves us all sinners in God’s sight. On Judgment Day we will be found guilty, and end up in Hell forever. But Jesus Christ paid our penalty by dying on the cross 2,000 years ago. The Bible says, “God demonstrates His own love toward us, in that while we were still sinners, Christ died for us.” Then He rose from the dead and defeated the power of the grave. If you repent (turn from your sins) and trust the Savior, God will forgive your sins and grant you everlasting life. Only He can save your immortal soul. Turn from your sins and put your faith in Jesus Christ, then read the Bible daily and obey what you read. Think of the words on this bill: “IN GOD WE TRUST.” He will never let you down. 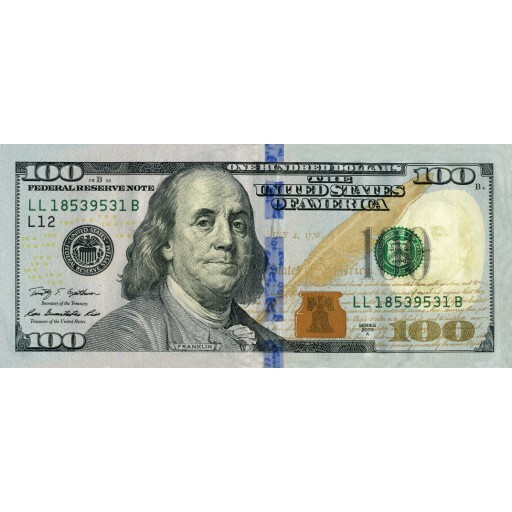 Four people are depicted on the bill: Ben Franklin, the Secretary, the Treasurer, and, of course, God. Read “Save Yourself Some Pain” at LivingWaters.com (where you’ll find many free resources and unique gospel tracts).